If you have garlic cloves or garlic powder and salt in your pantry, you can make your own garlic salt. It's easy to mix at home, takes very little time and can save you money. That spice jar of garlic salt you see at the grocery store contains nothing more than garlic powder with some salt mixed in. Now that you know this little secret, you can make it yourself, save a trip to the store and maybe even pack it in decorative jars for a simple, yet useful gift. If you have garlic powder on hand, just mix one part garlic powder with three parts salt. Store it in an air-tight container until you need it. Be sure to label the jar and put the date on it so you don't forget what's inside. 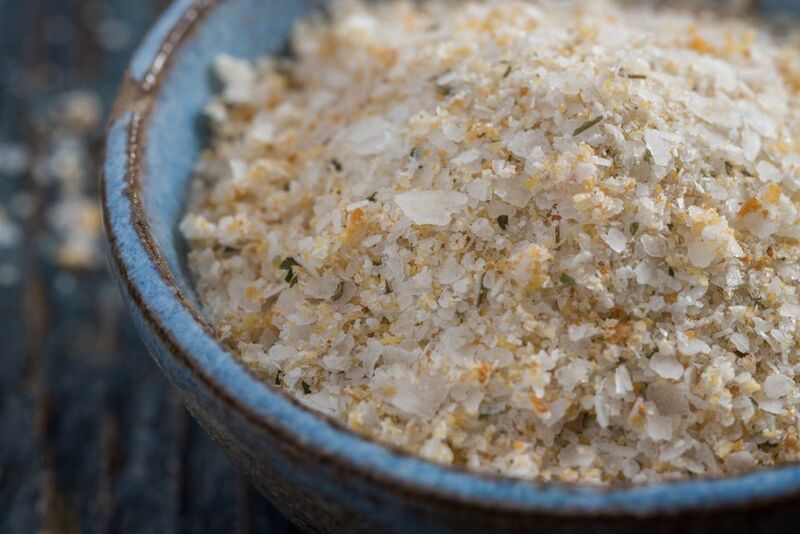 With just a few steps you can have a batch of fresh, fragrant garlic salt. Peel the garlic cloves and place in a food processor. Add the salt, preferably Kosher salt. The iodine and other minerals in table salt or celtic sea salt can cause the garlic to discolor. Process the garlic and salt mixture for about 20 seconds until it reaches the consistency of sand. Spread the mixture on parchment or a silicone baking mat and place on a baking sheet. Bake in a 180-degree oven for about an hour, until the mixture is dry and crisp. Use the oven heat to dry out the garlic slowly, but avoid browning it. Add the garlic salt back into the food processor and pulse it a few times until it resembles the texture of cornmeal. Store the mixture in an air-tight jar in a cool, dry place. Label and date your garlic salt, and discard any remainder after three months. For a tasty and eye-catching variation, try adding dried parsley or oregano to the food processor along with your garlic and salt. For a peppery version, grind up black peppercorns in a coffee grinder; they're usually too small and hard to grind finely in a food processor. Add the ground peppercorns to your garlic and salt mixture in the food processor and process. You might find that the added pepper allows you to reduce the salt in the mixture and still retain a delicious, flavorful mixture. These recipes make it easy to make as much or as little as you want. Make a big batch to save time in the future and ensure you always have it on hand for quick garlic bread and other recipes. You can also make only as much as you need at the moment, which means you'll have one less spice jar to store in your pantry. Ensure a never-ending supply of garlic salt by growing your own garlic. It's fun and relatively easy to grow in the garden. Each clove can be replanted to create a new bulb next year. It makes for one of the best frugal gardening crops because a one-time investment in seed can be turned around for years with proper care. Only large, perfect garlic bulbs are suitable for long-term storage or replanting. Making garlic powder is a great way to use any undersized bulbs or those that were damaged during harvest. It's really easy to do and tastes fresher and better than the garlic powder you'll find at the store. Now that you know how easily you can make garlic salt, you'll be delighted to know that onion salt and celery salt are just as easy. Replace those store-bought seasoning salts in your pantry with homemade versions as you run out. In the end, you'll save money and probably find that your dishes are more flavorful.